Scrapbook punches can help you create some amazing effects. The shapes they produce are precise, uniform, and just like little building blocks to me. though it might rather puzzle him to do that." 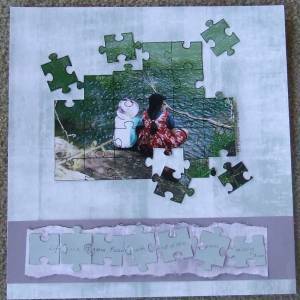 I need to give lots of thanks to Vanessa from Lismore, New South Wales for generously allowing me to photograph this page from her albums to show how a jigsaw punch can be used. Vanessa used her shaping tool to cut an entire photo in pieces, then re-assembled the picture leaving some of the pieces loose. Doesn't the texture of the water look great when the picture is put together in pieces like this? And the placement of the loose pieces makes me focus more on the figures in the photo. I really like how Vanessa then cut some more puzzle pieces and assembled them into a title bar at the bottom of the page. That's a clever echo of her photo technique for me. If you like this effect too, did you know that you don't actually need a jigsaw tool to create it? Of course, having a jigsaw punch will make the project a lot easier, but if you are good at drawing random puzzle pieces or if you have an actual jigsaw puzzle itself, use the pieces to trace around on the the back of your elements with a pencil, then carefully cut them out with your Paper Snips or a sharp scalpel tool on a self healing cutting mat. I can imagine using this particular puzzle shape on a handmade greeting card. It would make a great themed shape for an adult who likes to work out puzzles, or for a child who enjoys them. Change the cardstock or designer series paper you use to suit the recipient and colour scheme of your card. You can purchase so many other lovely punches from the Stampin' Up! range, so do have a browse of the latest ones.